Photos for this article courtesy of Hyman Ltd.
Its front-wheel drive was innovative; its design was low, sleek and daring; and many owners loved it. The Cord, both the L-29 and the later 810/812s, won speed race awards and design accolades. Even though the Cord was never a great commercial success, it's definitely a classic we'd all love to own. Born July 20, 1894 in Warrensburg, Missouri, Errett Lobban (E.L.) Cord was destined to be a deal maker. His dad C. W. was a grocer and his mom Ida Lobban a teacher. When E. L. was ten, his father's general store failed and C.W. moved the family to Joliet, Illinois where his wealthy brother-in-law offered to set him up in a jewelry store. In 1904, when the brother-in-law picked up stakes to move to Los Angeles, C.W. and his family went along, too. In Los Angeles, E. L., who confessed himself crazy about cars, went to a polytechnic school. Whether in school or hanging around with the guys, E. L. started learning more about how cars worked. By age 15, he was done with school and left to take a job as a used car salesman, taking business courses at night at the local YMCA. His father died in 1911, leaving him with a mother and sister to care for. It helped that his mother was earning money managing an apartment building but E.L., no doubt, felt obliged to help support his family, as well. Somewhere along the way he got the notion of "improving" cars. In 1913, he bought his first car — a Model T Ford speedster — for $75, threw the old body away, gave its new body a flashy paint job with nickel plate accents, and sold it for a tidy profit. Next he purchased a new Model T, gave it similar treatment, and sold it for nearly double what he'd paid for it. A quick learner and a lover of speed, he discovered early on that if he won a race in his modified car, he could sell it on the spot for several hundred dollars more than he'd otherwise get. So he became a regular on the dirt and wooden track race scene. To support his automotive pursuits, he took a job in an auto shop as mechanic and service station supervisor and talked the owners into letting him work on his own cars after hours. In September 1914, he eloped, driving one of his special Model Ts — with a "For Sale" sign on it; no opportunity missed. By the end of that year he had bought and sold something like twenty cars, making a good profit on each of them. That was the year, too, that, in partnership with a cousin, he bought a truck and secured a hauling contract to take ore from an Arizona mine to a mill at some distance. By the next year, however, he'd grown restless, a condition that befell him often. Leaving the business in his cousin's hands, he moved his growing family to Phoenix where he worked as a salesman for a Paige car agency and continued to race. For a time it seems he worked at an electric company, perhaps selling components that had become more familiar to him through his work on cars. He also entered several other businesses that failed in short order. One was a bus service that transited from Los Angeles to San Diego, another a car rental agency with only one car in its fleet. When businesses failed, like any good entrepreneur, he had no trouble picking himself up, dusting himself off, and starting all over again — and more than once. By 1919, however, his luck and his pluck were running out. He left his family with his mother in Los Angeles and headed to Chicago to see what he could scour up. He had managed to get an introductory letter to Harold T. Ames, a gentleman, like Cord, in his mid-twenties who was selling Chandler cars for the Hay Company. When Cord asked to see Mr. Hay, Ames arranged it. As E. L. made his pitch seeking employment, he casually lit up a cigarette. Since Mr. Hay hated cigarette smoking, the interview was over. Fortunately, though, Cord had impressed Ames or maybe Ames just felt guilty for not having mentioned the boss's smoking ban. At any rate, Ames put Cord up for a while. When the boss went away on a month's holiday, Ames also introduced Cord to Jack Quinlan, the dealership's sales manager, and Quinlan hired him as a salesman. Cord didn't disappoint him, in time becoming his top salesman. Although he was doing well, Cord was still in search of the next big thing and, in 1920, secured the California sales rights to a new home gas heater. He bought a used car, built a wooden crate to fit in the back seat to hold camping gear, and headed west. He hadn't been in California long, however, before he learned that new state laws had been enacted requiring features for heaters his model didn't have. Cord was busted again. He tried selling real estate but that led nowhere. His luck, however, was about to improve. Quinlan, who had just secured the Moon car distributorship for the Chicago area, asked him to return and offered him the opportunity to purchase a 25% interest in the business, to be paid from future commissions. Cord gratefully accepted the offer to sell Moons which looked a bit like small versions of the Rolls Royce Silver Ghost. The Moon was doing well, in 1922 outselling Buick in the Chicago area. Cord again succeeded as a low-key, sincere, extremely knowledgeable salesman. Nonetheless, he felt the urge for independence and sought his own territory, taking a Moon dealership for Iowa, Minnesota and Wisconsin and relocating to Milwaukee. He did very well there, too, but sold out after about a year to return to Chicago and buy back into the Quinlan organization. He became Quinlan's General Manager and amassed nearly $100,000 in commissions. With a bankroll in hand, he once more became restless, this time looking for an opportunity to buy a manufacturing company and make his own cars. One of his friends located an opportunity for him in Kokomo, Indiana. Before he could land that deal, though, Cord sold a Moon to Ralph A. Bard, a gentleman two years older than he and a member of the Board of Directors at Auburn Automobile Company. The two chatted about their mutual interest in cars, one thing led to another, and Cord was invited to look around the Auburn lot. In 1924, the Auburn Automobile Company was on its last legs, with low production, seven hundred unsold cars, and a considerable inventory of car parts. At 29, E. L. had already succeeded — and failed — at many businesses. Now, with money in his pocket, he swelled with confidence. After a tour around the lot, he was offered a top management position. Rather than accept that, however, he countered with his own proposal: full decision-making authority, 20% of profits, along with an option to buy controlling interest in the company with earned profits — if he could save Auburn. Thinking he just might have the moxie to save the enterprise, Auburn's owners agreed to his terms. The company vaulted back to life. In November of 1925, just over a year after he took control, E.L. had accumulated enough profits to exercise his option and buy out the company owners. Harkening back to his earlier days, Cord had the cars on the lot repainted with two-tone paint, adding some nickel-plated finishes. Calling Auburn dealers together, he presented the new models and offered them at a huge discount. In short order, the cars moved off the lot. 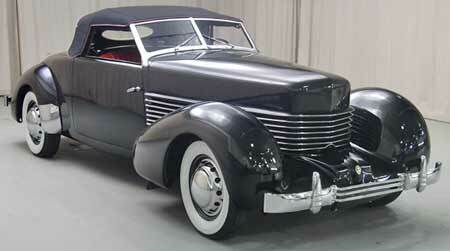 Although Cord took a loss on them, he had capital in hand to build new, appealingly modified models. He had used his time with dealers wisely, too, asking them what changes they thought would sell. That knowledge did not spell an end to his troubles, though. Auburn had been unable to pay its suppliers and its engine supplier quit delivering. When Cord heard that Lycoming, an aircraft engine maker, had a straight eight engine, he purchased some of those instead and had them installed in the Auburn chassis. He started to advertise the newly painted models with their new engines. By year's end, while Auburn was still in the red, things were definitely looking up. Cord continued to rally Auburn dealers and sales kept improving. After three successive years of vastly improved sales figures, Auburn was operating in the black. On February 2, 1926, Cord, aged 32, became its President and assumed complete control. Once he owned Auburn, he started to acquire other interests, as well. Over time he bought Lycoming, Duesenberg, Checker Cab, New York Shipbuilding, and several car body and aircraft companies. The first car to herald its owner's name, with internal project number L-29, was to be priced between the Auburn eight and the Model J Duesenberg. It was both beautifully designed and America's first production passenger car with front-wheel drive. The allure of the front-wheel drive sprang from Earl Miller's success with front-wheel drive race cars. Among its advantages were a lower center of gravity, less wind resistance, reduced weight, and greater cornering power. A number of passenger car manufacturers were interested in the concept but it was E. L. Cord who hired Miller as a consultant, offering him $60,000 to be paid over five years, along with a royalty on each car sold. Told he'd have to use a Straight Eight engine and standard transmission parts, Miller brought engineer Cornelius Van Ranst (a former Indianapolis 500 driver) in as project director. Van Ranst expressed concerns about the Frankenstein-like approach but Miller's race car engineer Leo Goossen knew it had to be done and helped Van Ranst make it happen. There were problems with inadequate stiffness in the car's frame that caused doors to fly open, so Auburn's chief engineer Herbert C. Snow pioneered the first "X" braced frame. Because the straight frame, without a rear kick-up in the frame to clear a rear axle gear housing, was used, the car's profile was very low to the ground. The L-29's chief stylist was Alan H. Leamy, a self-trained designer who had heard about the project and written to Cord directly, soon thereafter being hired at Auburn. He developed the Cord's sport styling: its low chassis, set-back radiator, sloping fenders and V-shaped radiator grill. Its windshield rose straight up from the cowl at a 90 degree angle, and it sat on a 137-inch wheelbase. The hoodline that seemed to go on forever was not just for show; the straight eight engine was exceptionally long, lengthened further by the clutch, transmission, and differential placed ahead of it. Despite the length of the engine, it wasn't terribly efficient. Rather than maximize horsepower, its builders wanted to achieve the best low-end torque, so drivers wouldn't have to shift gears often. A hotshot driver could max the car out at 80 mph but its typical running speeds were much lower than that. The team's first model became operational in November 1927, and E. L. came out to the Miller shops in Los Angeles to test it around the city and up into the Santa Monica Mountains. There was some lurching of the front wheels, later to be resolved with constant-velocity U joints, but the car was deemed ready for further refinement and was sent on to the Duesenberg plant in Indianapolis. From there, in August 1928, the car moved to Auburn. The next iteration of the car was operational in January 1929, and E.L. himself, accompanied by a mechanic and traveling in cognito, drove one of the prototypes 10,000 miles cross country, listening to comments from those who beheld the startling new car. In March, another four preproduction cars hit the roads. Auburn compiled the comments, tweaked the car a little, and got it ready to go. In June 1929, the improved model had its European debut — to great acclaim. Many Europeans felt as though an American car finally approximated their idea of good design. Back home that summer, the new Cord's graceful lines won stares and popularity. Its lowered height (a full ten inches lower than other cars of the time) and its ingenious headlights captured special attention. Rather than the typical cross bar, struts pinned the fenders to the radiator shell and headlights perched on the struts. The car came in four models: 6-window sedan, 4-window brougham, 4-door phaeton, and cabriolet. Weighing in at 4600 pounds, it boasted 125bhp and sold at prices between $3095 and $3295. An ad firm created the Cord crest that was the crowning touch on the hot new car: closed knight's helmet, three hearts and three darts, further proof that a Cord owner was among America's elite. Sales were brisk, and plans were mounted to bring more Cords to sales room floors. As Cord said in an interview for 1930's Modern Mechanix, "The new car is being built for a distinct field — for those who demand the advancements that only a front drive car can give and are willing to pay the price for these advancements." A stylish ad of the day featured a photograph of a young woman in riding clothes holding her horse by the reins, alongside a Cord with a female driver and passenger. "The Cord creates a place for itself no other car has ever occupied," the copy read. The appeal was to those who had money, and it seemed there were plenty who qualified. Among them was famed architect Frank Lloyd Wright who purchased a Phaeton and had it painted Taliesin Orange. Wright thought of cars as a way to move people away from central cities and often designed carports (a term he coined) for homes. Besides thinking the L-29 stylistically "becoming to [his] houses", in his autobiography he also wrote that he found front-wheel drive more "logical and scientific" than rear-wheel drive. Despite its famed purchasers, however, no one had foreseen the October crash in the stock market. Almost overnight capital losses were so severe that even those with sufficient remaining funds to purchase a Cord would think two or three times before laying out the kind of cash that could have bought them a couple of lovely homes. Cord had pushed its developers hard to bring the Cord to market quickly but his timing couldn't have been worse. The following year, the L-29 was chosen as the official pace car of the Indianapolis 500. Despite its time in the limelight, and even with a $700 discount, the Cord's sales were lackluster. The Cord turns shorter than any other car of comparable wheelbase. No other car as long as the Cord turns as short nor with as few revolutions of the steering wheel. The Cord requires less motion of the driver's hands and arms. Because the power is applied to the front wheels, the Cord always wants to go in the direction the front wheels are pointed. The power helps to steer. Due to the high ratio of sprung to unsprung weight, possible only with front-drive construction, the Cord holds the road much better and affords greater riding comfort, especially under adverse road conditions. The absence of any tendency of the Cord to tip or lean on turns means better control and greater safety. The rear wheels do not bounce around but follow in a true manner. There is no inclination to sidestray over cobblestones and chuck holes. Because the king pins in the Cord are practically perpendicular, you do not have to jack up the weight of the car in order to steer it. The only steering effort required is simply the turning of the wheels. Owners tell us that in driving the Cord there is a very noticeable difference; less mental and physical effort; and a sense of comfort, ease and security that is exclusive with the Cord. Despite its mechanical advantages, its price tag kept buyers away. Cord persisted, though, and in other efforts to attract buyers that year, turned the spotlight on the car's safety features and its overall value. One ad featured a Cord on a rainy road with the headline "FRONT DRIVE IS SAFER." After a year's proof of front-wheel drive superiority, the text claimed, the Cord had become "the standard of value among fine cars." And, the claim continued, "it does all the things any other fine car can do, with less driver effort, with greater riding comfort, with better roadability and with greater safety." Another ad of the day went further still, predicting that public demand would force other car makers to adopt front-drive construction. It had come through its probationary period, the text read, and "today ranks supreme among fine cars in advancement and value." The reliability of that prediction would later be questioned since Cords still didn't sell and since front-wheel drive did not come into common usage until GM introduced it on its 1966 Olds Tornado. In 1931, Auburn posted record profits but Cords still weren't selling well. Ads pandered to high-class would-be owners, those with "high and exacting requirements" who demanded "a different roadability" and were "intolerant of anything less efficient, less comfortable, and less easy to drive [than the Cord]". Cord continued to place safety ahead of all other L-29 attributes. As one ad had it, "Safety should outweigh all other considerations in the selection of your vehicle for personal transportation. Even comfort, both mental and physical, is dependent upon SAFETY. Body styles, the number of cylinders and all other features become mere details when compared with the outstanding need for SAFETY. Because it is structurally different from all other cars, the CORD front-drive offers exclusive SAFETY advantages." The question for customers remained, however, "Just how much safety can I afford?" In December, 1931, production of the L-29 ended. Rather than the anticipated production of 10,000 cars per year, over four model years only 5010 cars had been built. Although the hand writing was on the wall, in 1932 Cord still thought he could turn things around with something different. The E-1 prototype was to have been that difference, a car 20 inches longer than the L-29, with a 16-cylinder engine. Hey, if a little difference had astonished the public in 1929, a lot of difference a few years later should accomplish the same thing; right? But even Cord had to admit that this version was a non-starter and scrapped plans to build it. About this time Cord had more than a car empire to worry about. As he invested more and more heavily in numerous enterprises, he began to take part in business practices we'd now recognize as suspicious at best and perhaps even illegal. It was customary in those days for those born with a silver spoon in their mouths to manipulate stock and exchange insider trade information. E. L. learned quickly and began emulating that style. He was known to call friends and associates and ask if they wanted in on the investment action. But he wasn't one of the favored. When analysts determined that these practices were, in part, to blame for the depression, the federal government began to enact new laws. Resentment towards the upstart Cord grew as his power and influence rose, and over time both the SEC and the IRS investigated his financial dealings. Cord had been down the road of disappointment many times, and many times he had risen above it. Setting aside his own worries, he continued to believe Americans would come out of the Depression ready to spend freely once more. He also thought a newly designed Cord might be the way to get them to part with their money. Despite having divested himself of the majority of his Auburn stock in 1932, he remained actively involved in automotive matters, and in the spring of 1933 was made Chairman of the Board for the Cord Corporation, the holding company for Auburn, Cord, Duesenberg, and other enterprises. Capital was hard to come by but he had high hopes. Cord had surrounded himself with friends he could trust. When he purchased Duesenberg in 1926, he asked his old Chicago friend Harold T. Ames to become its general manager, and later, its president. Another friend, Roy H. Faulkner, had become president of Auburn in 1931 when Cord was named its Chairman of the Board. Faulkner retreated from Auburn later that year, following his fortunes instead first to Studebaker and then to Pierce Arrow. W. Hubert Beal, who had been president of Lycoming, filled in. Under his lax management, however, Auburn's dealership network atrophied. At that time Lucius B. Manning, vice president of the Cord Corporation, was effectively making corporate decisions. He had been Cord's attorney and friend and was named vice president when the corporation was formed in 1929. When he traveled to the 1934 New York auto show, Ames tagged along and was not reticent in expressing his opposition to the Auburn's styling and its resulting slow sales. Manning liked what Ames had to say and moved him over to Auburn to straighten things out. Just as he began his work, however, the very popular Faulkner was rehired as Auburn's president. Since Ames thought he'd earned the job, he was fuming at Faulkner's return. Ames was as hard charging as Faulkner was laid back but Ames had to settle for being executive vice president at Auburn. While there was bad blood between the two men, their association led to the emergence of the Cord 810. While still at Duesenberg, Ames was searching for a fresh new design for a mid-priced "baby Duesenberg" he hoped would be a strong seller. He recalled that in 1929 he had hired wunderkind designer Gordon Buehrig to develop the successful Model J and thought Buehrig might be the key to the new Duesenberg, as well. In the wake of the depression, Buehrig was then back at GM's Art and Color Studio with Harley Earl (where he'd been employed before Ames came calling the first time). In 1934, Ames conversed with Buehrig and invited him to return to Duesenberg. Buehrig accepted, itching to refine and utilize some of the design ideas he'd sketched out for a GM design contest where his team's design came in dead last. While not the winning entry, fellow designers loved his novel design. 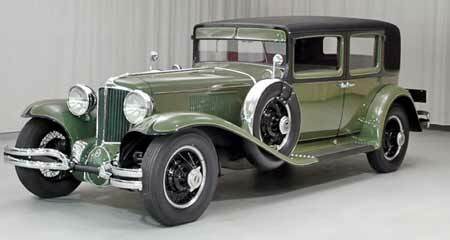 Ames ordered a prototype 125 hp V-8 engine from Lycoming and Buehrig started work on what Ames called a "tricky body" for the secret project, one that was to produce a front-wheel drive car with independent front suspension. Buehrig wanted to develop a sealed engine compartment so dust and dirt wouldn't invade the car, and he wanted the radiator fans and two small radiators located outboard on either side of the hood. In short order he also developed pontoon fenders and non-functional louvers to trim the front of the hood. Phil Derham saw to the body engineering. Augie Duesenberg, under contract, had the task of altering the engine and developing an experimental chassis to handle the outboard radiators. By April, 1934, a running prototype was completed but the project was put on hold. While Duesenberg's fortunes were sliding, Auburn's sales were nothing short of disastrous. After Ames was sent to fix things, Buehrig was also shifted to Auburn to bring his magic to the styling of the '35 and '36 Auburn lines. Then, in July 1934, Buehrig and his design team got a new assignment. They were to take the idea of the front wheel drive "baby Duesenberg" and come up with a new design package — for a Cord. They began their work eagerly but by the beginning of 1935 there wasn't enough money for them to continue. In July 1935, though, the project was infused with new life when Auburn subsidiary Central Manufacturing negotiated a half million dollar contract with Montgomery Ward to build metal kitchen cabinets. Faulkner hoped that money, along with income from a bond he hoped the Board of Directors would float, would be enough to develop the new model. Although the 1935 New York auto show was less than four months away, E. L. decided the stylish new Cord would be rolled out there. While Ames hadn't loved the initial clay model for the Cords, Faulkner strongly supported it. And once E. L. had convinced the Board of Directors the Cord 810 was just the ticket for struggling Auburn, everyone was on board. Desperate times called for desperate measures, and the workers surely felt that desperation as they scrambled to design and assemble parts, materials, suppliers, etc. Assembling a single model would have been madness but the Auto Show required a manufacturer to produce 100 cars, a sheer impossibility. E. L. leaned on the show organizers and got them to accept fewer cars. Problem solved — only not quite since the cars were being built by hand with metal workers hammering out sheet metal on the spot. There was also the slight problem that none of the eleven cars built was really drivable since there just wasn't sufficient time to complete the transmission tooling. Despite the functionality issues, however, the car was a major hit, with spectators ignoring other models and clamoring to get a glimpse of the Cord 810. The buzz was further accentuated with the Cord displayed on a spinning turntable. Buehrig and his team had designed a real knock-out. The unibody construction was novel but the streamlined design elements were astonishing. The 810 had a low, sleek profile with no running boards, a coffin-shaped hood, and massive pontoon fenders with headlamps that the driver could hide by means of a mechanical crank. Other cars of the day had stand-up grilles to cool air and set off their design. The Cord, on the other hand, had a louvered wrap-around grille. No radiator was visible. Non-functional louvres curved around the front of the engine compartment. Other avant garde features included a rear-hinged hood, hidden door hinges, a concealed gas tank filler, and mirror-imaged doors (the left front and right rear doors were the same, as were the right front and left rear doors, all hinged at the center pillar). There was a horn ring rather than a button. The divided vee windshield was sloped at a 45-degree angle and could be cranked open — and there were variable-speed windshield wipers at a time when few cars had any windshield wipers at all. A small divided cathedral window was at the rear, and there were pivoting, crank-down rear quarter windows. There were ventilating holes in the hub cap, serving a functional (heat reduction) as well as styling purpose. Its dashboard was truly sensational, as well, looking more like the front cabin of an airplane than a car of the time. The instrument panel was engine-turned, meaning there were overlapping circles ground into the metal. There were large, round instruments for the speedometer, tachometer, oil pressure gauge, and clock — all set in chrome. The temperature gauge and radio dial were smaller round instruments, and the ammeter and gas gauge were fan-shaped. The car weighed in at 3500 pounds and boasted a maximum speed of 100 mph. Its fuel economy was more than 16 mpg. It had a four-speed, semi-automatic transmission. An integrated Bendix shifting mechanism ahead of the differential was shifted by an easily-operated fingertip-type gearshift lever. The driver chose a gear on the steering column, stepped on the clutch, and the gear engaged. The car was available in three body styles: four-door sedan, four-seat phaeton convertible, or two-seat sportsman convertible coupe, each with a 125-inch wheelbase. Its interior was just as flashy as its exterior. Seats (luxurious armchair-type in the front) were comfortable and there was plenty of leg room, front and back. Rather than the mousy-colored plain interiors of other cars, this one had pleated English broadcloth upholstery in a color that contrasted with the exterior finish. It was piped in a leather trim matching the exterior. One example was painted a light gray with wine-colored upholstery trimmed with gray leather piping. The steering wheel rim was finished in Tenite (a new plastic that could be molded in colors) matching the color of the piping. While many years into the future, in 1996, American Heritage magazine heralded the Cord 810 as "the single most beautiful American car". Requests for more information and numerous orders flooded in. Anxious to close deals, salesmen at the show promised Christmas deliveries. Auburn, however, was in no position to deliver. The transmission was still problematic and there were other mechanical challenges, as well. Ames had thought ahead and had had one hundred 1/32nd scale bronze models of the Cord made so they could be delivered to waiting customers, along with an apology for the delay. The toy car was not the real thing, of course, and one hundred models were not nearly enough to match actual orders. When the production cars began to be delivered in April 1936, owners had long ago lost patience. Some withdrew their orders; others began to get a queasy feeling as other car manufacturers took steady aim at this radical — and unproven — Cord. It didn't help, either, that customers discovered performance glitches. After all, they were paying top dollar (about $2000 when a Packard sedan was going for a little more than $1000) for their cars, and they expected perfection. Still, there were press accolades for the impressive new car. Crowds continued to mob car shows in Los Angeles, Chicago, and London just to get a glimpse of the new car with art deco styling. One ad proclaimed Cord's quality in every detail and cited Cord as "the acknowledged style leader", another declared that Auburn "dares to depart from the conventional — dares to take leadership." One first-time viewer said that the Cord 810 "looked like a beautiful thing that had been born and just grew up on the highway." The good news was how quickly the Cord 810 captured the popular imagination. The not-so-good news was that Auburn had depleted its treasury to build it and that its mechanical problems persisted. Some parts had been left off; others were not tightened well enough. There were leaks, vapor lock, a noisy fuel pump, and slow acceleration. In early models, "ghost" transmissions sometimes, with the car running, shifted back to neutral on their own. With the convertibles there was considerable rattling and shaking. There was poor visibility through the small front and the smaller yet rear windows. In short, though lovely, the Cord 810 was a lemon. In its first year Auburn only sold a little more than a thousand of them. Still convinced that the Cord was the ticket to economic stability, Auburn stuck with it in 1937, changing its designation to the Cord 812. It now offered six body styles (Westchester Sedan, Beverly Sedan, Convertible Coupe, Convertible Sedan, Custom Beverly and Custom Berline) and prices increased on all models. Because some owners had complained about the lack of trunk space, the new Beverly sedan, priced at $1995, came with a bustle-shaped, i.e., stuck-on, trunk lid. 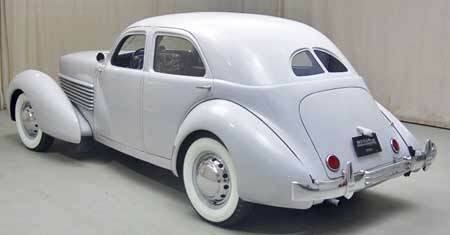 And the 1937 sedans had a longer 132-inch wheelbase, resolving concerns about limited back seat legroom. Complaints about the lack of headroom in the 810 led to a slightly higher roofline with increased headroom. For Cord 812 interiors there were also more color choices for paint and upholstery than ever, both standard and (at no extra cost) special combinations. Customers looking for a little more pick-up could opt for the supercharged package Auburn already offered on other models. The supercharger cost a little more than $400 and boosted speeds up to about 110 mph, making the Cord one of the fastest cars on the road. Schwitzer-Cummins built the supercharger which vented exhaust through external chrome-plated exhaust pipes which ran on both sides of the hood and into the fenders. Some portion of the added costs for the 1937 Cords must have gone to advertising since there were a number of print ads extolling its virtues. One began with a series of questions as to why buyers would pay more for ordinary objects: "Why do some people pay $750 for a gun when they can get one that will shoot, for $50? Why buy a mink coat when one costing only a fraction as much affords warmth?" "The answer," claimed the ad, "is found in human nature — in the constant reaching up for betterments — in the desire for greater enjoyment in utilitarian things." Claiming the Cord was the "utmost in luxurious, quiet, enjoyable transportation," it was touted as "the inspiration for all automotive engineers, pointing the way for them, to future developments!" Another ad featured a photograph of a young starlet along with a list of her "favorites" — favorite sport, opera, perfume, etc. Her favorite motor car? Why, Cord, of course. The ad closed with this line: "Other drivers can pass my Cord, but only when I let them." Clearly the Cord 812s were meant to appeal to the horsey set. They were shown in Hollywood films and driven by the likes of Tom Mix, Gary Cooper, Tyrone Power, and Clark Gable. One ad showed a distinguished older man in coat and tie surrounded by vignettes of air travel, ship travel, etc. The text ran, "Of course, I own a Cord, and naturally it's Super-Charged. As someone said, a man counts his years only when he has nothing else to count. I like to go places and do things.... Since I dislike the commonplace it is only natural that I want my motor car to give me pleasure in addition to transportation." Following in that same vein, another ad showed a sketch of a carefree young woman, swept by a breeze. It encouraged parents to buy their daughters a Cord: "Her intolerance of the commonplace, her shunning of the mediocre, and her seeking for the new and swank things of life, keep us young. She deserves a Cord!" In 1951, the Museum of Modern Art showed eight automobiles as sculptural design, including a Cord in that number. The Cord, with its smooth surfaces and rounded corners was shown as a visually striking piece of sculpture, the catalogue noting that "...many of the Cord's lines are borrowed from aerodynamics. ...the Cord suggests the driving power of a fast fighter plane. It is, in fact, a most solemn expression of streamlining." Despite its sculptural qualities, 1937 buyers who wanted a reliable ride had already moved on to the next thing. So, despite the improvements in the Cord and the advertisements keeping it at the forefront, sales were even slower in 1937 than they had been the previous year. 1937 was the year when Cord sold his 30% stake in the Cord Corporation and a new Board of Directors began running things. Auburn was contemplating a Cord 814 with a few stylistic modifications from the 812 — but the Board of Directors decided almost immediately to cease production of the Cord. In 1938, Auburn was in receivership. But in 1940 a version of the Cord 812 was on the market again. For just $45000 Norman De Vaux, who had been in the car business for years, bought the Cord body dies in summer 1938, hoping to build a low-priced but stylish car. Lacking the funding to produce the car himself, he approached Joseph Graham, president of Graham-Paige. Graham didn't bite but did recommend that De Vaux contact Wallace MacDonald, vice president of Hupp Motor Car Company. Hupp offered to make De Vaux its general manager and pay him a salary as well as a royalty on each car produced. In 1939, Hupp was announced a Junior Six that was eventually to have rear wheel drive and a 115 inch wheelbase. The front end was altered slightly (by John Tjaarda, famed for his work on the Lincoln Zephyr) and it went on show at the New York Auto Show as the Hupp Skylark with three body styles — sedan, cabriolet, and phaeton. It didn't attract much attention, there were significant production problems, and only 35 cars were made. De Vaux again approached Graham-Paige, suggesting that they take on manufacture of the Skylark at their plant, in exchange for use of the Cord dies with which they could build their own car (later named the Hollywood). A deal was struck in September 1939. Graham-Paige produced a single-piece roof die to replace the seven-piece roof Auburn had built, welded together, and struggled with because their presses were small. By May, 1940, both Skylarks and Hollywoods were available — but only for a few months. Sales were practically non-existent and Hupp couldn't afford to pay for the Skylarks produced. Graham-Paige dropped the sales price on their Hollywoods nearly $200 but that didn't help either. Hupp closed its doors and, in September 1940, Graham-Paige announced they were closing their car production facility temporarily to gear up for the war effort. In total, only 2,200 of these cars had been produced. Financier Dallas Winslow knew a good thing when he saw it. He bought up spare parts and the rights to the name of cars from defunct manufacturers. In 1938, for $85,000, he bought Auburn's inventory, naming his concern the Auburn-Cord-Duesenberg Company. He was a parts supplier and offered automotive service, as well. Then, in 1960, Glenn Pray, who was a high school shop teacher and owner of a small car repair business, convinced Chevy dealer and friend Wayne McKinley to bankroll him so he could buy out remaining stock and naming rights from Winslow's firm. He had about 350 tons of NOS Auburn and Cord parts moved to Broken Arrow, Oklahoma. Pray continued as a parts supplier but also had a dream of reviving Cord production. He approached Buehrig, then working at Ford, for design assistance in fashioning a two-passenger version of the Cord 810, assistance which Buehrig agreed to provide. Once, while Pray was visiting Buehrig, representatives from U. S. Rubber were there, as well, hoping to interest Buehrig in Royalex, a body composite. Pray, sensing an opportunity, related his dream of a new Cord, and U.S. Rubber offered to provide tooling and body panels at no charge. Their hope, of course, was to prove the product to major car manufacturers. The replica Cord introduced in 1966 was a scaled down version (roughly 80%) of the original Cord, with a six-cylinder Corvair engine and optional turbocharger. Fewer than a hundred of these were made before money ran out. In 1968, Howard Williams, an Oklahoma state legislator and friend of Bill Lear (founder of LearJet) bought the company and reorganized it as Sports Automobile Manufacturing Company, or SAMCO. SAMCO built a few more of Pray's Cords before deciding on a restyled version with either a Ford V-8 or Chrysler and rear-wheel drive. Thirteen more 8/10s were produced by SAMCO, after which a restyled Cord with either a Ford or Chrysler V-8 and rear-wheel drive went into production. The car was available in two models, the Warrior with a 108-inch wheelbase, and the Royale, with the longer 113-inch wheelbase. Roughly 400 of these were built but by 1970 production ceased. Cord's founder E. L. Cord, in selling his shares of the Cord Corporation, became a millionaire. He headed back to California where he made other fortunes in real estate and mining. In the 1940s he moved to Nevada where he served in the state legislature. In 1974 he died at age 79. The Cord was the car that would never die, appearing and reappearing over the years as a coveted model. In 1937 Ab Jenkins, in his Cord 812, set U.S. stock car speed records that would hold for nearly twenty years. The "Classic Cord" Hot Wheels toy car of the 1960s is one of the most valuable made. Collectors prize their L-29s, their bronze models, their 810s and 812s, and the later replicas. The Cord L-29 and 810/812 were ahead of their times both stylistically and mechanically. Their front-wheel drive and their astonishing beauty have influenced and inspired other car makers, owners, artists, and afficianados.